Ahosen Lomamökit is situated by a lake 30 km from Rovaniemi along the road 4 (E75) to Sodankylä. First you arrive at Vikajärvi village, where you can find a shop and a petrol station. 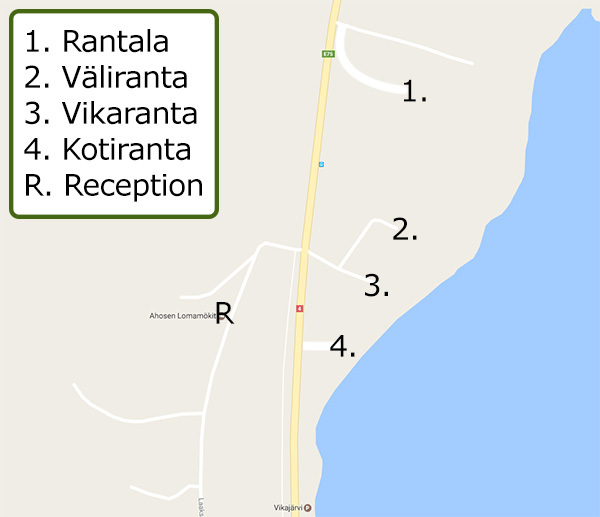 The cottages are located about 4 km after the Vikajärvi village along the road 4 (E75). A big brown road sign: Ahosen Lomamökit is 1km before the cottages on the right side along the road. Another road sign is just next to the cottages on the left side along the road. Turn left and you will see a map, where our cottages are located. You can also drive up to a hill where the reception is in a red building. 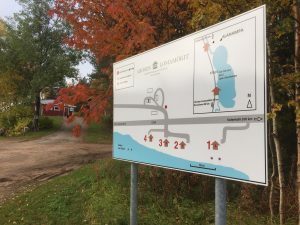 Remember to take a local/vakio (not express) bus to Sodankylä, The bus-stop is the last one in Vikajärvi where the road lights end, 4 km from the village. It is about 100m from the bus-stop to the reception. Express buses (pikavuoro) stop only at the Vikajärvi village 4 km before the cottages; even they drive along road number 4 and pass the cottages. Buses via Kemijärvi turn to the Kemijärvi road (82) at the Vikajärvi village 4 km before the cottages.